Luminati.io Review - Residential IPs Never Get Blocked & Why 4.8 Stars? 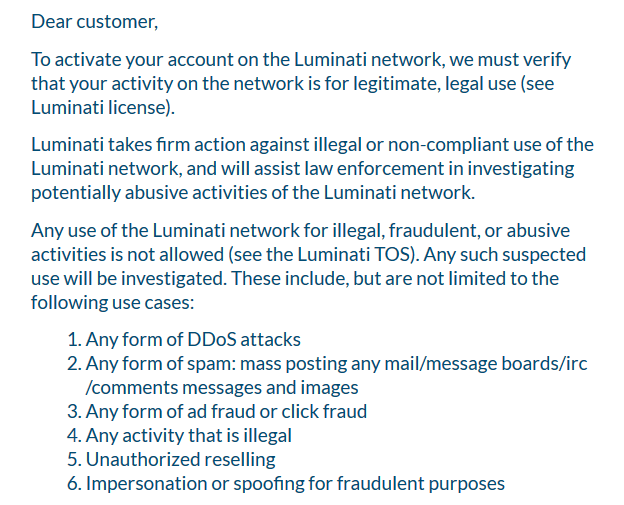 Luminati is a residential proxy provider that in many ways beats its competition. The number of IP addresses as well as the countries that they are in makes it the largest network of proxies in the world. Luminati.io is a company that grew much faster than its competitors. What initially started as an IPS company, today it’s the largest network of data center, residential and mobile proxy IP addresses. 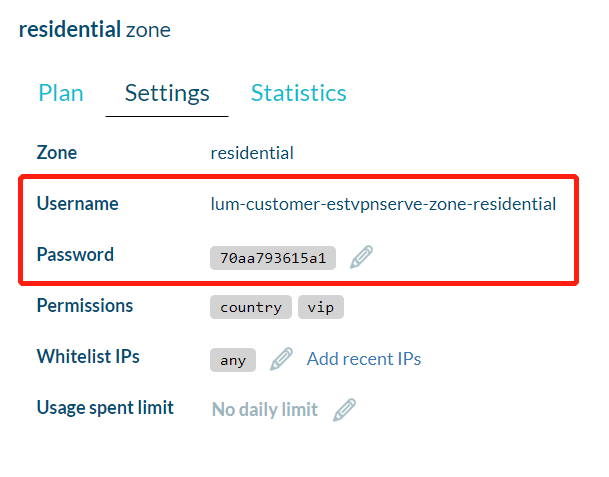 Ask anyone that has ever used a residential proxy provider, and he will tell you that Luminati is on the top of the list. Offering over 36 million IP addresses (data center, residential and mobile) in over 200 countries and regions, it is understandable why they would be the first choice. Providing services for beginners to IT professionals, Luminati is a company worth looking into. On today’s review list is Luminati. As we mentioned, they have an IP pool that is much larger than any other residential proxy provider. At this point, they have over 35 million residential IP addresses, over 300k data center, and over 2 million mobile addresses. That is more than most of their competitors combined. They claim that the addresses are from over 200 countries and regions. That means that if there is internet somewhere, they have an IP address there. Luminati.io operate their proxy network via their free VPN service named as hola VPN. When someone installs the hola VPN in their browser or download the hola VPN client software on their PC, they’re promised to share their internet connection to use, Which works a little like Tor network. Location searching for a city is not as detailed as it should be. Not the cheapest provider online. We already mentioned that Luminati sells three types of IP addresses: data center, residential and mobile IPs. Each of them several pricing packages depending on the type of address you are looking for. That is the largest pool of IP addresses that Luminati has to offer. 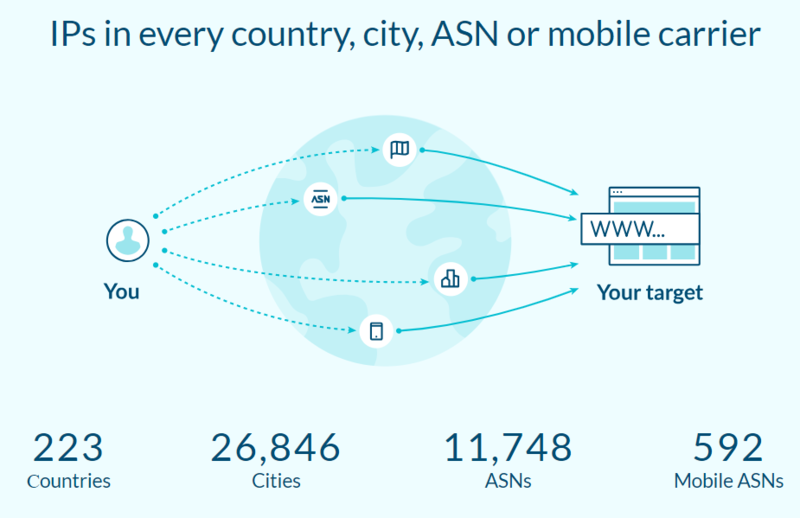 The shared IPs can be geo-targeted by country or city/ASN. The dedicated ones can only be targeted by country, and you have the option to select the number of IPs that you need, and I not recommend you use the dedicated IPs for the residential plan, for the price too much high! Let me show you the price plan comes in a shared IPs, For its the residential IPs, If you want to use luminati.io residential proxies, the shared IPs are the ideal and recommended package! If you still want to use the dedicated IPs to use the datacenter proxies are a good alternative. In short, For residential IP proxies, We recommend you buy the shared IPs plan! No need waste money to buy dedicate IPs plan of residential proxies. Another solution of IPs are the data center ones, which much cheap! Usually, other data center IP proxies provider offer the proxies as dedicated proxies, but the luminati.io provide the data center IPs as the residential proxy network. The reason for that is that they are static IP addresses that come from a data center somewhere in the world and in almost all cases these are consecutive IPs. If you are a first time user or still not sure what type of addresses to get, these are a good start for its much cheaper. First of all, as we mentioned, these are much cheaper to buy from luminati. Another positive side is the fact that there isn’t a monthly payment when compare with others. Instead, you pay based on the bandwidth that you use. Alternatively, you can also use the Luminati Proxy manager for setting custom rules. These are the advantages that they can offer, but there are down-sides as well. Their data center pool of IPs is around 330,000 IPs in 1320+ subnets, and since they are consecutive, it shouldn’t come as a surprise that they are already flagged as proxies. That will prevent you from getting access to certain services. If this is the case, then you might need to think about other types of addresses. They are divided into shared and dedicated. Both come from a pool of IPs in 87 countries. For both of them, you can choose the included bandwidth in your plan. If you choose the dedicated ones, you can also pay for an unlimited plan and choose how many IP addresses you need. The datacenter dedicated IP proxies cost $0.1per GB, If you want to get unlimited bandwidth per proxy, which cost $0.5 per IP, For unlimited bandwidth at least buy 50 IPs. 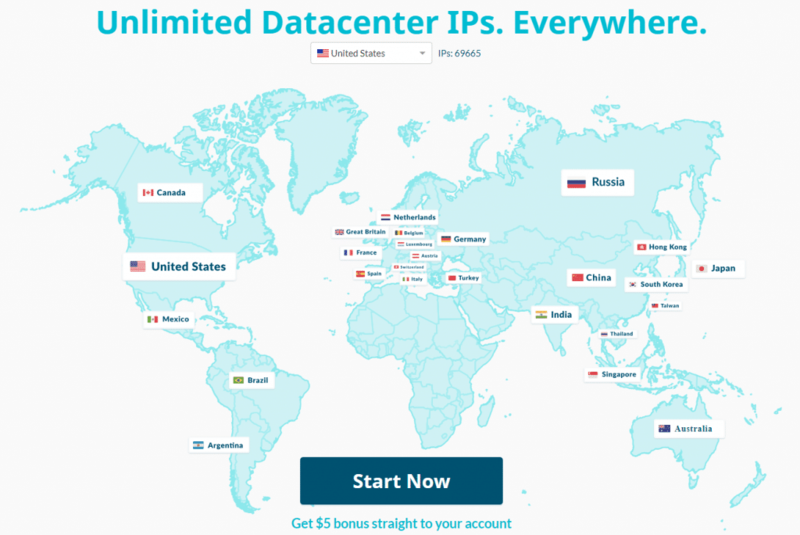 The datacenter Shared IP proxies cost $0.5 per GB, The IPs will be allocated from their data center shared pool of 150,000 IPs across multiple datacenter providers and you can configure the countries in your Zone! The last is the mobile IP addresses. Same as before, these can be shared or dedicated. Also, the shared ones are where you can only select the amount of bandwidth that you need for your plan. The dedicated plan allows you to select the number of IPs and bandwidth. For the Mobile IPs, are also residential IPs, So when you need to buy the mobile IPs proxies, We also recommend you buy the shared IPs plan! All plans that Luminati can offer unlimited, but you have to pay more. The bandwidth that you choose is included in your monthly payment. Once you “cross the line” you will be charged per gigabyte, depending on the plan. When it comes to products, Luminati doesn’t over a long list of products for you. 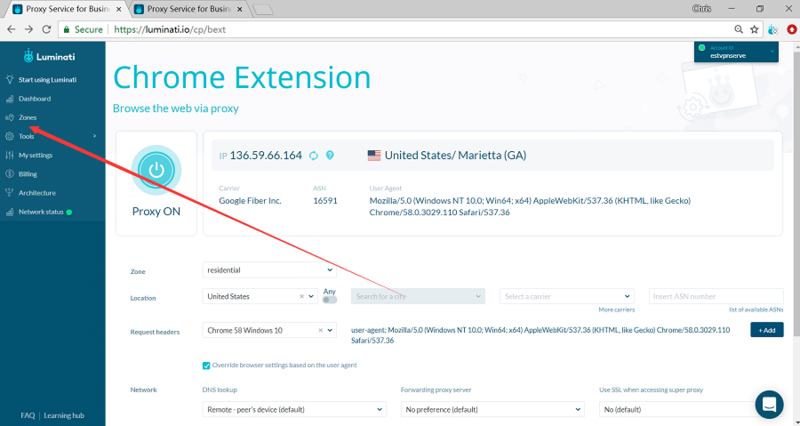 For the basic use, you get a Chrome extension perfect for keeping a single IP session for a longer time. If you need to scrape data, then you can use the proxy manager to set everything up. Because luminati.io mainly offer the residential IP proxies, So This reviews we mainly discuss about their residential proxy network! Though We buy both their datacenter proxies and residential proxies, We may discuss their datacenter proxies on the later. We read all over the internet for companies that sell proxies from over 100 countries and regions. That is impressive, but what Lumianti has to offer is even more impressive. They claim to have proxies from 223 countries and 26846 cities. If we compare this to any of their competitors, it is clear why they are considered the best. Your scraper is as fast as it is the proxy that you are using it. That is very true. A slow speed or big latency can have a great impact on whatever you are doing. The speed of the proxy determines the amount of data that can pass through the proxy and the latency or ping the time it takes for the data to make a round trip to the contacting server and back. Having this in mind, we tested Luminatis proxy addresses. Bear in mind that speeds vary depending on the type of proxy. That means that the speeds and ping will not be the same for the data-center, residential or mobile ones. Here we test their residential IP proxies (shared IP plan) via their chrome extension. The screenshot above is the speed and ping test on our VPS. Once we had this as a comparison, we tested a few or Luminati’s proxies. We conducted the test on speedtest.net, and as usual, we ran 16 tests. Ten of those proxies were the US, three were the UK, and the other three were from Canada. The table below shows the ping and speed results of the tests that we conducted on the proxies. If we take into consideration that these are residential proxies, the results are surprising. In general, residential speeds are not great, but the results we’re seeing here show that Luminati’s residential proxies have almost data center speeds! The results are amazing! And really fastest in the world! Luminati has IP addresses in over 200 countries and regions. We already mentioned that this is something that we should praise. But saying that and delivering that are two different things. We did a location test with the proxies from the speed test to see just what type of addresses we got. Does Luminati really provide the 100% residential IPs? check ours ISP Test! These results are just what we expected, so no surprise here. All tested IP addresses are the residential IPs. If you are working with posting or verifying ads or scraping data from sites, then you know that for that task you need a good proxy. Most of today’s popular sites have a certain geo-restriction so you won’t be able to access them from anywhere. Also, they are very good at discovering proxies. To see how undetectable Luminati’s proxies are, we did another test. The results are mixed. Even though these are residential proxies, some sites blocked them, while others didn’t. Only one IP address was able to pass Nike’s guard, Should be lots of guys use their proxies for Nike, while all addresses managed to gain access to Instagram or Craigslist. Luminati.io is one of the best residential IPs providers! 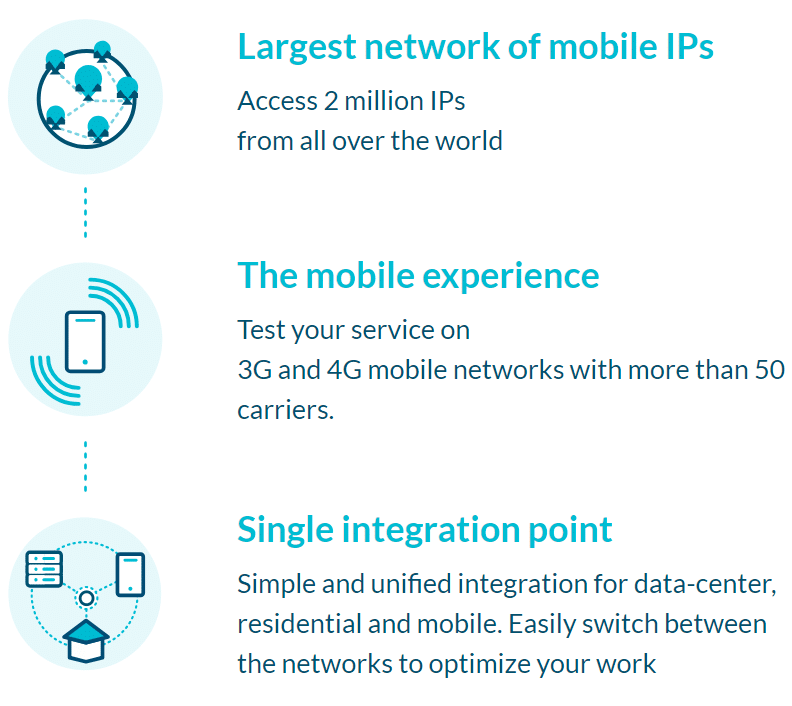 No competitor can offer such big Business Proxy Network that Over 36M residential IPs in their P2P network, and with the most fast speed connection! Their residential proxy network is #1 choice for residential IPs solution! Lots of Fortune 500 enterprises are using their proxy service. Most proxy providers sell data center proxies, so they are the most common ones and consider the price of their data center proxies, their no much advantages of the datacenter proxies, and you can order custom packages, is one of the best advantages of their datacenter IPs plan. Finally, only a hand-full of companies sell mobile IP addresses. Luminati is a company that has all 3, making it one of their greatest advantages. Another great advantage that Luminati has over its competitors is the location of the proxies. They have over 35 million proxies in over 200 countries and regions. Combined with the ability to use an IP address from a specific city from a list of over 20000 cities and you get the king of the hill. The types of IP addresses and the ability to customize the usage of the proxy makes them a very flexible provider. Almost no other provider can offer you to set up custom rules for each request within their proxy manager. Luminati does. This is the reason why Luminati is the company to go when you need to scrape data fast. The unlimited concurrent requests from multiple IPs at the same time will shorten the time amount to scrape the data that you need. The ease of use is something that can be true and false when it comes to using Luminati. Their chrome extension is very easy to use! Really a great products on the proxy field! All you need to do is set up a zone, install the extension and start using it. The dashboard and the proxy manager are a bit more complicated to learn, but once you get the hang of it, they won’t be a problem. Usability aside, the IP addresses that they sell don’t disappoint. You can get data center, residential or mobile IP addresses. Each of them can be used as a sticky or static address or a rotating one. The static IP addresses(dedicated IPs) enable you to keep a session active with the same IP address. Luminati has no limit on this, so as long as there is an active internet connection at the host, you can use it. The best way and the easiest for this is to use the Chrome extension. If you need to change the address of the entire machine, or you need to use it on a different browser, then you need to change the proxy settings in the control panel. The rotating addresses are the ones where you need a different address after a certain period or after a completed request. The rotations rules of the addresses can be set up through the proxy manager, where you get all kinds of settings and rules, customizing them based on your needs. Luminati has two ways of authentication: with an IP or username and password. Authenticating with an IP is mostly used in situations where you use the proxies on a few devices. You can whitelist an IP once you create a zone. When you click on the newly created zone, on the right side, you will see “Whitelisted IPs.” Click on the pencil icon next to it, enter your IP address and click “Save.” You can add more than one address. If you want to use Luminati with a username and password, then the process is slightly different. First, in the whitelisted IPs section, you will need to type in “any” and click “Save.” When you go back to the zone, on the right side, you will see your username and a generated password. If you want to change your password, you need to click on the pencil icon next to it. You can read our guide to Luminati: What’s the Luminati and How it works and Get more details on how to set up and use their residential proxy network Here. Picking the right proxy provider isn’t always easy and straightforward. There are multiple choices when it comes to pricing, features, and products, so our job is to make a choice easier. Using Luminati hasn’t been the easiest thing in the world. Unlike other competitors, where everything is laid out e easy to reach, Luminati can be a struggle. The Chrome extension is easy to use, while the dashboard and proxy manager need some getting used to, especially if you need to customize the rules for your proxies. This is not something that Luminati is best at. The prices are not the lowest ones that you can find online, but if you take into consideration what you get for that, it might be worth it. If you are uncertain if you should give them a try, they offer a seven-day free trial. The 99.9% network uptime, as well as the network monitor, show that Luminati’s proxies are reliable. Even though we didn’t have any need to contact support, some users online claim that sometimes it takes time to hear back from them with a solution to your problem. That can be avoided if you head over their FAQ section. There you have a detailed explanation from start to finish along with samples on how to use their proxies. Luminati is a sure win. It is true that there are some drawbacks with them. The price and getting used to the dashboard and the proxy manager might be a problem for some users, but it is worth it. Getting access to over 36 million residential IP addresses in over 200 countries and 20000 cities is something that no other company can offer. 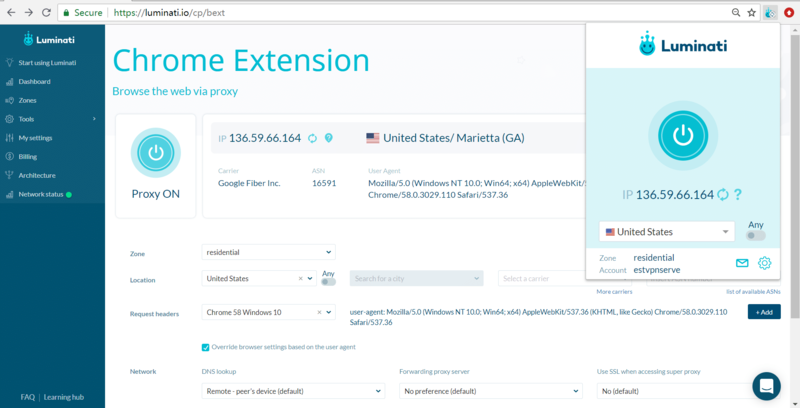 The Chrome extension makes Luminati perfect for first-time users looking for a change of IP, and the proxy manager makes them perfect for IT professionals.